Besides the previously announced Visconti Merry-go-round for Meyer, whose purchase supports the homonymous children’s hospital in Florence (Italy), the new models available at Giardino.it include two novelties by Visconti, Divina Elegance and Venus, the Dama set by Omas, Cohiba Black (with finishings in ruthenium), a desk set in polished burl by Marlen, and the Pen of the Year 2014 by Graf-von Faber-Castell in platinum and jasper as a homage to tsarina Catherine II from Petersburg. Three are the new models by Visconti for this Spring 2014. 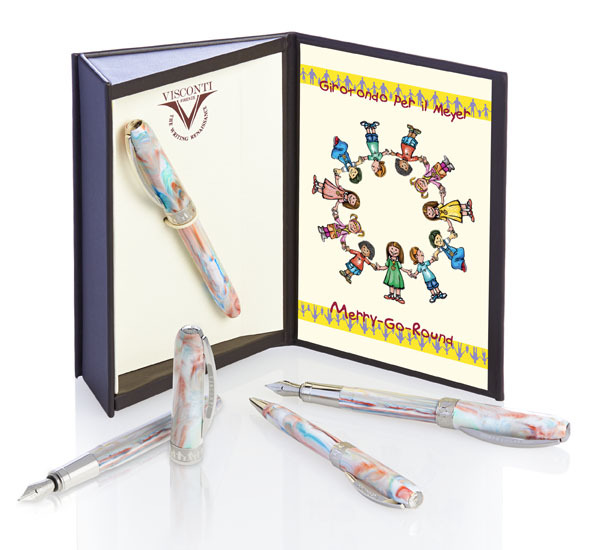 We have already mentioned Merry-go-round for the Meyer, a perfect ‘first pen’ for every kid, which not only is beautiful but is also good: a great part of the proceeds from sales of this pen will be donated to support the purchase of critical medical equipment for the Meyer children’s hospital in Florence (Italy). You can purchase your Visconti Merry-go-round here. 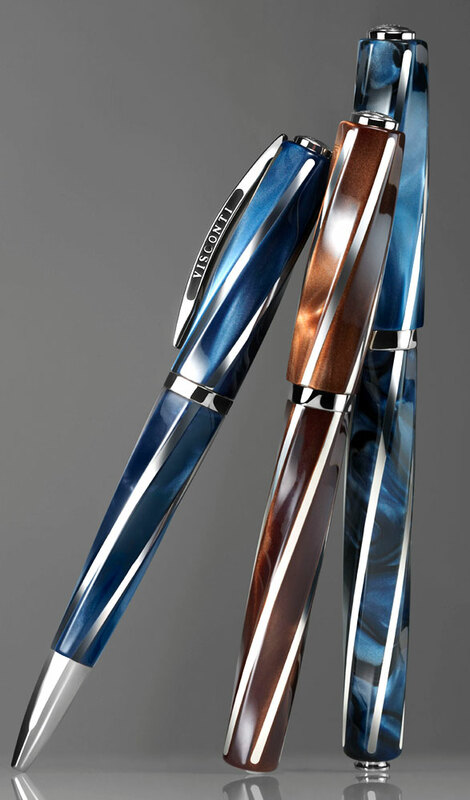 Nonetheless, there are two brand new models by Visconti, namely Visconti Divina Elegance (on sale after Easter) and Visconti Venus. Divina Elegance owes its name to the measures of its cap and body, which comply with the parameters of the Golden Ratio (1.618), meaning that their ratio is the same as the ratio of their sum to the larger of the two quantities. Furthermore, the pen’s body was inspired in its shape by the Golden Spiral and then enhanced by Visconti with handcrafted sterling silver threads. Other features of this ‘divine’ pen are the Dreamtouch 23 k palladium nib and its Push&Touch Touchdown filling system, with a concealed bottom button. Another pen of ‘divine’ nature, for a different reason, is Venus, whose design was inspired to the new Van Gogh model as a homage to the famous Venus by Italian painter Botticelli. Venus is available in two series, one in a pearly white natural resin with platinum-plated finishings and a steel nib, and one in a pearly pink resin with pink golden plated finishings and bronze nib. Besides the elegance and finesse of this pen, one of the features that will make you fall in love with it is the possibility of customising the cap’s tip by the magnetic initials of MyPenSystem, which also allows to restore the original Visconti’s rod (coming with the pen). Finally, its magnetic closure system further enhances the pressure of every click, making this pen even more comfortable for use. For collectors and hunters of limited editions, here are two models of prestige destined to be remembered in this Spring 2014. The first is Cohiba Black, a reinterpretation in ruthenium of the Cohiba by Omas – this is a pen with vermeil trims created in cooperation with Habanos. The match of ruthenium with the warm shades of ziricote wood of this pen results in one of the most recognisable and appreciable models in the market. The pen is available in 1,996 numbered items, corresponding to the year of foundation of the Cohiba brand: 1,000 of them are fountain pens with piston filler and the remaining 966 are roller pens. The other is Pen of the Year 2014 by Faber-Castell, inspired to the baroque Amber and Golden rooms in Catherine II’s palace, summer residence for the Russian tsars. The Russian tsarina was an energetic and enterprising woman, a well-known philosopher who kept here her mail with personalities like Voltaire and other Illuminists, promoting culture and the arts. The modern yet elegant style of Catherine II can be found in this pen created by Graf von Faber-Castell, who commissioned the same artists who decorated Catherine’s rooms for the inlays and decorations of this pen. This pen distinguishes itself for its body platinum-plated bearing three large red-brownish jasper stones and its platinum-plated cap with a solid and elastic clip. The pen’s body is also enriched by a braided inlay which can be seen in the Amber rooms of Catherine’s palace. The pen comes in a box with a certificate signed by Boris Igdalov, director of the restoration workshop for the Amber rooms, testifying the authenticity of the Russian stones. For those looking for something more demanding, here are two gift ideas (also for yourself) to add a hint of class to every desk or working environment: the Dama Set by Omas faithfully reproduces a model of the Forties. The handmade set comprehends a piston fountain pen of the Dama series and a ballpoint pen of the same series. The set was produced in a limited series of 131 items, available in the classic pearl grey box with pink gold finishings. The nib of the fountain pen is 18 k gold. 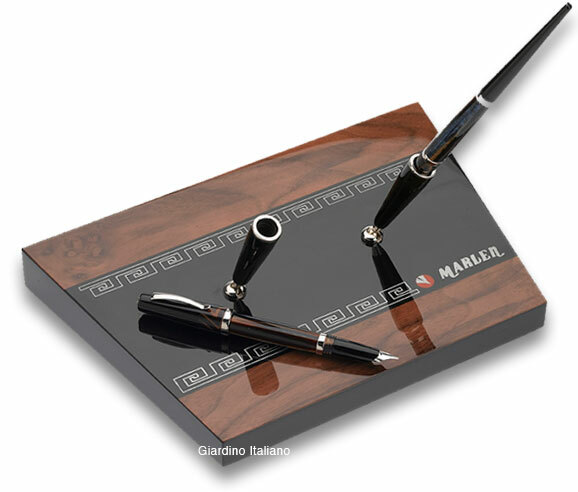 The other elegant desk set is a novelty by Marlen, a niche company from the South of Italy that we have already introduced to our readers. Marlen’s desk set is in polished burl and comprehends a fountain pen and a ballpoint pen in celluloid and resin, featuring interchangeable tips and caps. With all of the above, we can say that Spring 2014 is rich of novelties and new models: you just have to explore Giardino Italiano’s website and pick up the pen which best suits your style.